It's been four years since indie rap wordsmith Aesop Rock released his None Shall Pass album, and in that time, he's apparently developed a taste for collaboration. 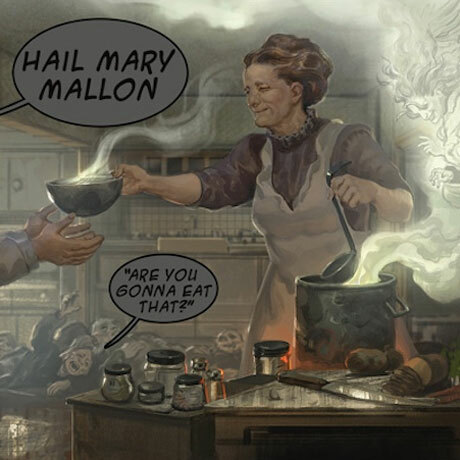 The New York-based performer has recently teamed up with Rob Sonic and DJ Big Whiz to form the group Hail Mary Mallon, who will release an album this year. The trio's debut effort is called Are You Gonna Eat That?, and if the tracklisting is any indication, religion serves as a strong theme with song titles like "Church Pants," "Holy Driver" and "Plagues and Bacon." Rhymesayers will release the album on June 7 on CD and etched, coloured double vinyl, with the record coming out digitally on May 3. A music video for album track "Smock" is available below. As if that weren't enough, Aesop Rock has also been collaborating with the saccharinely twee Kimya Dawson, who makes up one half of Moldy Peaches. The two have been collaborating on new music and will also team up for a U.S. tour. The track "Walk Like Thunder" -- which features Rock and Dawson, along with the Strokes' Nikolai Fraiture and John Darnielle, among others -- can be downloaded via the widget below.